Kim died in Aurora on 1/19/19. She was born 1/6/55, to Hertiel and Delores Preston, in Denver. She worked in early childhood education from the age of 17 until her death, owning and directing several schools. Children loved her. She and Dale Eiselt had two boys, Kevyn and Keythn whom she raised in Aurora, Co and Chico, CA. Kim reunited with Mark Wendorff, in 2011, after 40 years, having met in college. They were married 12/13/14. They had 4 wonderful years as Mr. and Mrs. Santa Claus. 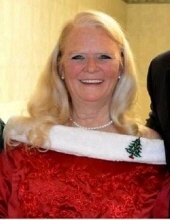 She is survived by her husband, Mark; her brother, Harvey; sons Kevyn (Mu) and Keythn (Melissa); stepchildren, Rachel (Joe) and Christopher (Bailey); Grandchildren, Elizabeth, Josie, Cairo, Madison, Elias and Xavier; her special aunt Juanita; and many other aunts, uncles and cousins, a very large and close family. She is preceded in death by her parents and brothers Greg and Terry. Services are at 11 am. on Friday, Feb. 1, 2019, at Trinity Church, 4490 Newland St., Wheatridge, Co. A reception/light lunch will follow. Any donations in her memory can be made to any organization helping with the Camp Fire, or a charity of your choice. To send flowers or a remembrance gift to the family of Kimberly Preston Wendorff, please visit our Tribute Store. "Email Address" would like to share the life celebration of Kimberly Preston Wendorff. Click on the "link" to go to share a favorite memory or leave a condolence message for the family.